Ahhh, the Bercy Supercross, where something spectacular always happens—and quite often that something is quite controversial. The 31st annual Bercy Supercross took place this past weekend in Paris, France, and I was lucky enough to be able to go cover it once again. I can’t believe the promoters consistently ask me to come to this race, but hey, I’m not going to try and change their minds. Nothing like Paris in the fall, where the bear-claws are hot and fresh, Starbucks is close by and cigarette smoke is everywhere. The crowd is something else. The place is sold out three nights in a row, the fans are right on top of you and they immediately let you know what they think. Chainsaws and air horns rule the day along with wigs, beer, cigarette smoke and who knows what else. And after the races the party keeps on going outside the arena. My sleep really suffered this weekend thanks to the Bercy SX fans. By the way, if the rumors are to be believed (and my source is pretty good on this) 2013 might be the last supercross at Bercy Stadium for a year or so. Seems that the arena, built in 1983, is undergoing major renovations that should take a year to complete so the promoters of Bercy have another venue outside of Paris in mind for next year. So there will be a Bercy SX in 2014, but it might not be in Bercy. I’ve been to Bercy six times now and I have to say that this year’s track was the best one. Yeah, they didn’t have the over/under bridge, which I love so, so, so much, but there was some thought and imagination in this year’s track that made it tricky and tough for the riders. There was a rhythm section where if you went double, triple and then hit it just right you could quad out. If you didn’t, you were forced to triple onto the table and then single off. Quading out was a bit faster. And then if you took the Joker Lane, you couldn’t do that rhythm either. That’s right, I said Joker Lane! It was back, baby! Although the promoters of Bercy had plans for the lane the whole time, the recent Monster Cup and its Joker Lane drama definitely helped the buzz for this year’s event. Surely no rider would once again forget to take this lane like we just saw, right? Last week in Genoa, Italy, Justin Barcia went 2-1 over two mains to edge his teammate Trey Canard out for the King of Genoa or whatever they call it. And at Bercy, Barcia went 1-1-2 for the overall win over, you guessed it, Trey Canard as “the Duck” went 2-2-1 for second. To be honest, these two Honda Red Riders were better than every other rider there. On Sunday, Barcia crashed in one of the elimination races and took Canard down with him (accidental) and both riders were forced to use gate picks four and five on a track that rewarded gate one or two every time. Canard came out about ninth or so on the first lap and Barcia was last. So it was looking like we were set up for a great main event until Canard and Barcia actually started, you know, riding. It was astonishing to see the two riders rip through the pack and quickly get into positions one and two in just seven laps of a fifteen lap main event. Nothing could stop these guys and they consistently passed riders even when it didn’t look like there was any room. Kudos to the Honda guys for putting on a show. 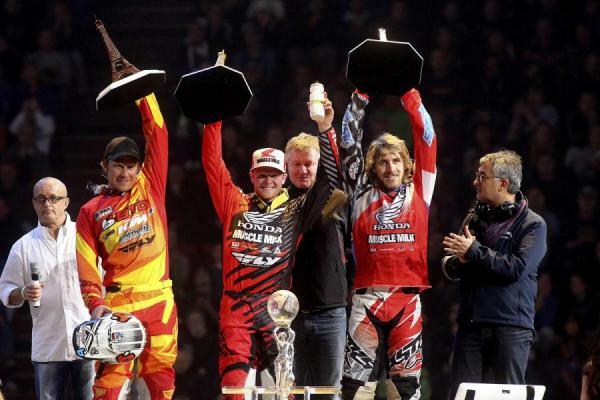 In the end, Barcia (right) would win his second King of Bercy title over Canard (middle) and Andrew Short (left). 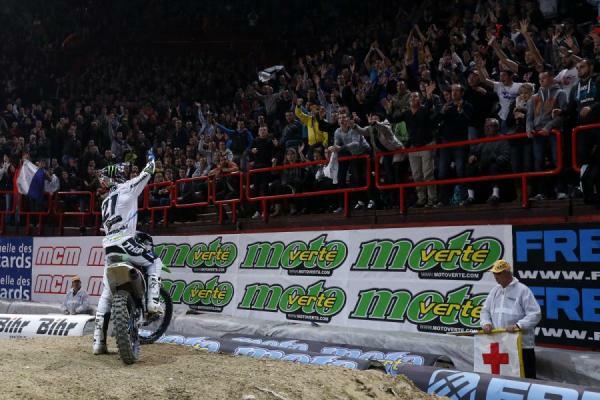 So Barcia wins his second King of Bercy title and congrats to him on that. The entire KoB (King of Bercy) thing came down to Saturday night’s main event where Canard had ridden brilliantly to track down Barcia from about four seconds back. It was a great ride and you could see Trey really nailing his turns in the tunnels of Omni Sports Palace. With three laps left, Canard saw an opening and pulled alongside Barcia in the whoops and made the pass. But Barcia smartly checked up in the whoops once he realized that he was passed and dove to the inside of Canard where, predictably, contact was made. Barcia came in hot and hit his teammate with a pretty good one. Luckily Canard stayed up and took a second place in the main. The next day, Canard was leading and Barcia was second but the drama simply wasn’t there. Barcia knew he would win the overall just staying behind Canard, although after the race Justin told me he was trying like hell to sweep the three main events. So was it dirty? Was it just racing on a tight track? I know I have four Manitoba titles and raced pro very briefly (and slowly) but I thought I’d send out the video and text a bunch of riders in my phone to get their opinion. You know, actual pro riders who actually race or have raced against Barcia and Canard before. I promised them all anonymity for their replies to me—but these are real quotes from real pro riders. As I said, these are all riders whose numbers I have in my phone, so I suppose you can rule out Ryan Dungey and that’s about it. Barcia's pass on Canard (above) Saturday drew mixed reviews. Good thing Honda Muscle Milk team manager Dan Betley was there to try and keep everyone in check and not let anything get silly. Not that it was, but hey, you never know. Welcome back to Bercy, Dan! I thought it was a little much to do that to your teammate when you’ve already been caught and passed. It wasn’t like you caught him and he was moving over and blocking you and going much slower. Or it wasn’t like there was a championship or a ton of money on the line. But that’s why Barcia is Barcia… he’s a special talent that, in a nod to EZ, has exactly NFG (look it up) on the track. It’s why he’s able to go in there and get some wins over the Villopotos, Dungeys, Stewarts, etc. And it’s why, when he rides well and gets third, he’s pissed when I go talk to him after the race. He’s got that chip on his shoulder and no one is going to be able to knock it off. 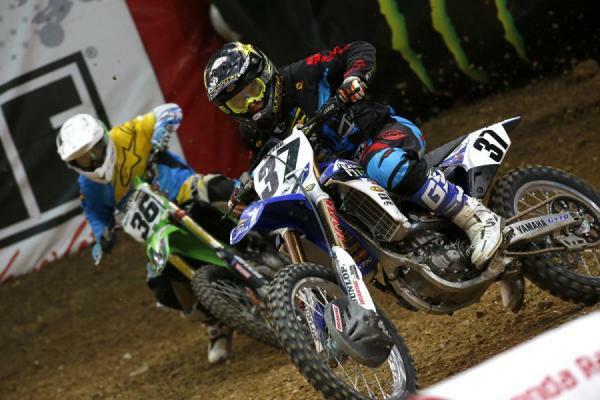 So clearly Trey raced Barcia hard all weekend long and took his share of wins against the #51. So what does this mean? I don’t really know, but probably nothing with Anaheim a long time from now. But I think it could mean that just like the past 28 races we saw in 2013, there wasn’t much to separate these two Honda racers at Bercy either. Yet another reason why I would be a crappy team manager: Canard, with the fourth gate pick for Sunday’s main event, chose to go into the second row behind Andrew Short (who was gate #1) rather than use a gate on the outside of row one. I didn’t like this move at all. I thought that since he would still get to line up inside of Barcia (who had an even worse pick), who was his main rival for the KoB title, he should go there. But nope, Canard lined up behind Short and of course he came into the corner last but he made the most of it and came out clean. I’d say it was a good choice by Canard and once again shows you that I am clueless. BTOSports KTM’s Andrew Short, a two-time King of Bercy, came back for his first time in years and enjoyed a nice little weekend of consistent finishes to put him third overall. Coming into Sunday’s main event he was tied for Gautier Paulin for third OA but used his upset win in the elimination races to get the first gate pick and pass Paulin early on in the main to win. But it never should have come to that as, unbelievably, amazingly, Shorty missed the Joker Lane in Friday night’s main event. 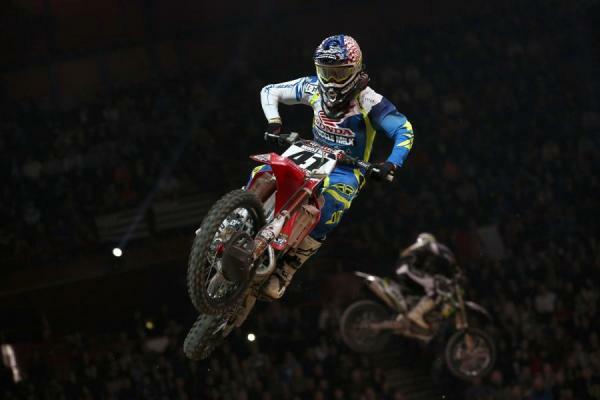 Andrew Short was back at Bercy and finished third overall despite being docked on Friday for missing Joker Lane. Yes, I’m serious. He was assessed a time penalty, which only knocked him back one spot and after the race Short admitted that he totally forgot the lane. Never once crossed his mind! He didn’t try to say that he couldn’t get into it one time, that a rider had jacked with him, that he didn’t see the last lap flag. Nope. Short said none of that mattered. He just plain forgot! If Andrew Short, one of the smartest, experienced and most thoughtful guys out there forgets to take the Joker Lane then what hope do we have for anyone else? We saw Villopoto and Dungey both miss it at the Monster Energy Cup and now Andrew Short joins that list. This should be all that Feld’s Dave Prater needs to immediately implement the Joker Lane ASAP because this thing clearly creates drama. Wil Hahn returned to Bercy for the second time and he’s making the jump full-time to 450’s next year so this was a bit of a measuring stick for him. And while he didn’t have much for the top two Honda guys (only about four riders in the world actually do) he was better than he was last year and showed speed. He crashed hard in Sunday’s main event on that quad out but he seemed okay back in the pits. Well, actually he seemed a little out of it but I interviewed him anyways. Hahn’s main events would go like this: bad start/take a few laps to warm up/ charge hard and come up short at the end. Then on Sunday he got a great start but crashed. So he couldn’t put a perfect 15 laps together in any one race, but he could do half of one each time. "But then he would slide his headphones off and start cracking on me! The guy doesn’t turn it off." Matthes on Wil Hahn (above). Hahn is one of the riders in the pits that doesn’t seem to be serious at any point whatsoever. He’s constantly joking or busting on someone or trying to make someone laugh. Bercy has a lot of downtime and there are times where I’m trying to let the riders have some time to focus and get ready for the race. And Hahn would have his headphones on looking all serious so I wouldn’t say anything to him. But then he would slide his headphones off and start cracking on me! The guy doesn’t turn it off. Cooper Webb was making his Bercy debut, but it was thrown together rather quickly as Kenny Roczen dropped out at the last minute for this race. So cue Hahn and Webb and it was pretty cool to hear the whole crowd serenade Webb for his 18th birthday on Saturday night. Early on watching Webb, it seemed that his 450 was a little much for him as he looked to just be hanging on. And Friday night went just okay for him. He had the typical “Bercy shakes.” But he and his team smoothed out his 450, made some suspension changes and Cooper was better on Saturday and Sunday. If Webb gets to go to Bercy again, like Hahn, he’ll be better. But all in all he rode well for a rookie and let’s not forget, he’s a 250 guy. The Monster Cup was Webb’s pro debut on a 450 and this was only his second race on the big bike. And he still hasn’t raced a regular supercross! I did get to go to dinner with Webb (and Hahn) on Friday night and bro down with him. So I think I built a little relationship with him, but when I was telling him how cool JT Dalmatian gear was, I might have lost any respect I had gotten from him. Kids! Cooper Webb had a solid showing in his Bercy debut. One thing that I think the promoters of Bercy should crack down on (and I have no idea how they would do this and they probably would never do it and maybe it’s a crazy idea) but the idea of Canard and Barcia bringing their full-on works bikes to Bercy while Webb and Hahn bolt on different stuff to a stock bike seems a little unfair. And Weimer last year, Stewart in the past, etc, etc. I’m not coming down on the Honda guys—all the top guys do it. And I’m also not saying that them having works bikes is the reason they were so fast—it’s just another advantage for those guys that the others don’t get. And the mechanic’s have to work their nuts off as well… can anyone think about the poor mechanics? Speaking of mechanics, Hahn’s guy Sean Irwin (who has won the 250 East and West SX titles along with a 250MX title—how many guys have done that?) was all by himself tearing down his bike. Meanwhile, Nate Alexander, Short’s guy, had factory KTM guys as well as Short himself helping out so I jumped in to help out Sean (who once was Timmy Ferry’s practice bike mechanic so we have that bond) and I was back baby! Changing out races, clamps, forks and all that was my job and it was nice to get a T-handle in my hand once again. By the way, if you’re in Paris and “Man has Forks Fall Off his CRF450” is a headline on the news one day, forget you read this. One thing about Bercy is that usually the slowest American rider there is faster in the whoops than the fastest European rider and I think that held true again this year (although Gautier Paulin was pretty good). The American riders have so much experience in real stadium races and also the suspension guys in America know what they’re doing when it comes to re-valving for the stuff. The Bercy whoops are real tough American-style whoops and it’s always a big advantage for the American riders… not too mention the full-works suspension they bring over. Oops, did I say that out loud? Gautier Paulin was showered with love from his home country fans. One cool thing about Bercy is all the time you get to just hang out. There’s plenty of time for stories and laughs. This might be my favorite part of the race to be honest. No one is hiding in any trucks and I was just grilling people like Jean-Michel Bayle, Stefan Everts and Dan Betley about the old days. Sometimes I even turn the recorder on and capture these moments. Look for interviews right here at Racer X Online and on Pulpmx.com of Everts and Bayle later this week. 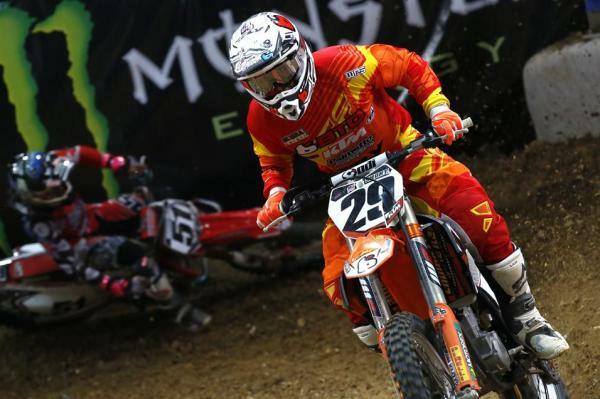 French heroes were Jordi Tixier on the KTM 350 and Paulin on his works Kawasaki. Both riders were obviously very popular and both showed good skills. Paulin has raced in America before and is probably the most “supercross ready” rider the GPs have. He even has a BMX background. He just came off his best GP season of his career (although injury shortened) and he told me after the race that after his next contract, he may look into coming to America like Eddie Murphy did.